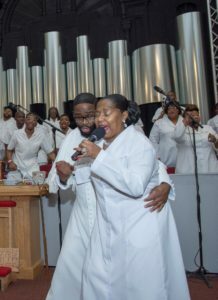 If you grew up Black and churched in the Chicagoland area, there’s a good chance you remember hearing “Jesus Can Work It Out” on the radio while heading to Sunday service or during your choir’s A and B selections. The Gospel song, recorded in 1980 by Dr. Charles G. Hayes and the Cosmopolitan Church of Prayer Choir (a.k.a. “The Warriors”) from Chicago’s South Side, is a timeless classic with a deeply relatable message. Despite all of life’s struggles, scraping up a few dollars for the “light bill due, a gas bill too” or even the baby’s new pair of shoes, it’s never too late to turn it all over to Jesus who can work the problems out. Just in time for the 2017 holiday season, “Jesus Can Work It Out” is making another comeback – this time in a national television ad campaign for the Google Chromebook. The Woodlawn-based choir’s foot stomping, hand clapping and soaring voices are inspiring America in a wonderful new way, after the choir’s remix of the song blazed airwaves in the 2000s. The Google ad, which began airing this month, includes samples of the song’s recent House remix by Karizma, a DJ from Baltimore known for his deep house production work. The commercial spot plays on the song’s lyrics to show consumers how the Chromebook functions as a one-stop shop to help them “work it out” in their daily lives – from online shopping and movie streaming to playing video games and working from home. Since the ad first aired on November 5, the phone hasn’t stopped ringing for Cosmopolitan Church of Prayer’s new pastor, Rev. Derail Smith, and the song’s lead singer, Williams. She wrote the track’s catchy and forever relatable ad-libs, a fan favorite, that are the centerpiece of the commercial itself. This past summer, Williams was ill and recovering in the hospital when Google reps emailed her about sampling Karizma’s House remix of the song in the commercial. The reps needed Williams’ permission since she was the second writer on the choir’s 1980 version. 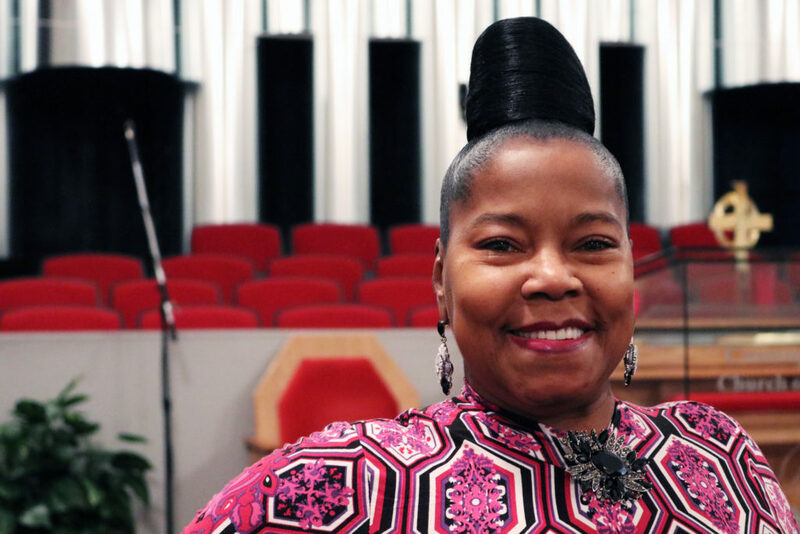 At the time, Pastor Smith gave her a call and said he’d heard that Karizma’s House remix played during Chosen Few Music Festival and Picnic in Jackson Park – with throngs of young people dancing a slide to the song. Smith sent the video to Williams. He immediately knew it was a sign of great things to come. The song itself was written by Elder George Jordan and first recorded in 1974 by the Christian Tabernacle Choir and Pastor Maceo Woods. (Jordan passed away a few years ago, Williams said). When Dr. Hayes and The Warriors recorded “Jesus Can Work It Out” in 1980, it experienced a rebirth at the time and drew wider notoriety. Williams and Smith said they’ve been encouraged by the renewed attention to “Jesus Can Work It Out,” as well as the resulting response from young people. While Gospel doesn’t always get mainstream attention, Williams said, young people like the beat and the words aren’t out of reach. The Chromebook commercial’s sample omits references to “Jesus” and “the Lord,” which raised some eyebrows from Gospel lovers on social media. But Smith believes the original message will still reach people. Williams added that the promo spot includes the line “He can work it out” and that people who are familiar with faith and God will still understand the meaning, as they have with various other Gospel songs that crossed over into the mainstream. The choir still performs to packed audiences at musicals and the church sponsors outreach programs, back to school drives, and connects people in need with food, shelter and resources. Williams and Smith credit Hayes’ longtime efforts to the church’s many successes, and acknowledged original songwriters and others who were instrumental to the recording of their celebrated hit. They hope the renewed interest in the song also amplifies the work the church and choir are doing in the community.